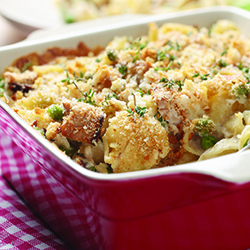 Make this casserole classic for a simply delicious dinner! Preheat oven to 400 degrees F. Mix soup, milk, peas, tuna and egg noodles together in half quart casserole dish. Bake for 20 minutes stirring every 5-10 minutes. Sprinkle cheese over casserole and bake for 2 more minutes until cheese is completely melted.